My heart leaps up when I behold yet another review or rating of my book on Goodreads or Amazon. I am grateful for each one of them. Thank you! “I have lent this book to my nephew now, who is studying… well, engineering. I am going to insist that the rest of the kids (who are still in school) in the family read The Reengineers too. Nothing can explain what I feel about this book better than this fact. 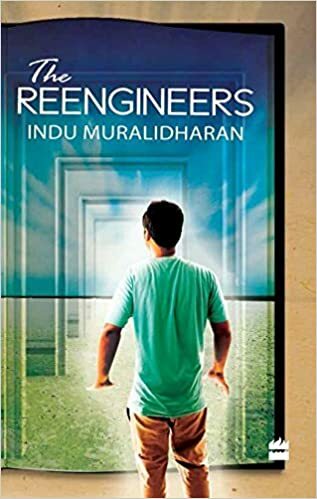 “The Reengineers by Indu Muralidharan is a fantastic read. It deals in a unique way the issue of depression. It also throws light on how people with vested interests try to monetize everything on their way. Be it education, relationships or spirituality. “The book is a beautiful and easy read. Indu builds the characters slowly and steadily. She has done a good job in writing in intonations, nuances and dialogues which are consistent with the characters. The classical title of the book, The Reengineers, pulsates with its romantic contents where reality and fantasy conjoin. On the eve of ending his life, the protagonist, Chinmay, wakens into a fictional world to meet a simulacrum in Sid, who has written a story about him. Is Sid Chimay’s future? And when Sid is in trouble does Chinmay help in order to correct what might very well be his own future, all this when the observe is in play? When and where do the future and past, reality and fantasy conjoin? Review of an early version of The Re-engineers from Publisher’s Weekly as part of the Amazon Breakthrough Novel Award competition, in which it was a semi-finalist.